Figure 6-43. 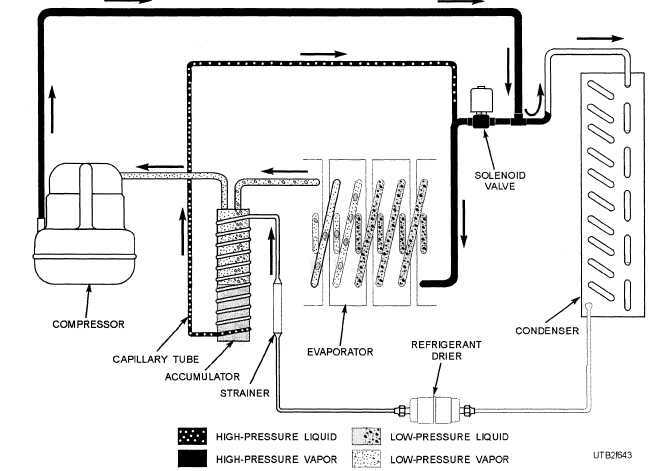 - An ice cube machine refrigeration cycle during the freezing process. the system to form corrosion products. A strong acid combined with high discharge and compressor temperature can cause decomposition of lubricating oil and produce a sludge of breakdown products. Either the corrosion or the oil breakdown products can plug valves, strainers, and dryers and cause a serious casualty. NOTE: The formation of ice from a minute quantity of moisture in expansion valves and capillary tubes can occur when operating below 32F. Adequate space should always be left around major portions of equipment for servicing purposes; otherwise, the equipment must be moved after installation so serviceable parts are accessible (figs. 6-45 and 6-46). Compressors require overhead clearance for removal of the head, discharge valve plate, and pistons with side clearance to permit removal of the flywheel and crankshaft where necessary. Water-cooled condensers require a free area equal to the length of the condenser at one end to provide room for cleaning tubes, installing new tubes, or removal of the condenser tube assembly. Space is needed for servicing valves and accessory equipment. Service openings and inspection panels on unitary equipment require generally at least 18 inches of clearance for removal of the panel. Air-cooled condensing units should be placed in a location that permits unrestricted flow of air for condensing, whether the condenser is in a unitary piece of equipment or separate. Inadequate ventilation around air-cooled condensers can cause overloading of the motor and loss of capacity.